Eight screens from Red Dead Redemption's forthcoming "Liars and Cheats" free-roam DLC hit Friday evening. They show off the new multiplayer characters and game modes that will be available when the pack releases Sept. 21. 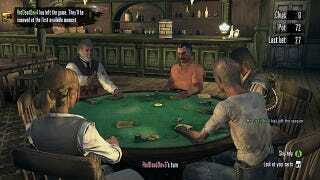 Multiplayer poker is one of the new diversions available. Marshal Johnson is a playable character. "Stronghold" also is a new multiplayer combat mode. Here the blue team defends its safecracker. Dutch van der Linde and Edgar Ross make a fine pair. Storming the gang hideout of Venter's Place. Multiplayer horse racing is a new feature. Competitors include Irish, John Marston, Marshal Johnson and Professor MacDougal. Four new Hunting Grounds are included. This one is "Broken Tree." Bill Williamson is also available for multiplayer use with Liars and Cheats.